An ETA/eVisitor visa is not a working visa but is mainly used for short term stays within Australia for tourism or for contractual negotiations. Further to this, business visitor activities such as making business enquiries and attending a conference are other permissible activities whilst having a granted ETA/eVisitor visa. Therefore, before applying for an ETA/eVisitor visa it is important to know what this visa allows you to do in Australia. Current passport must be valid at least for the next 6 months from the date of application. Applicant must be located outside of Australian territory during the ETA/eVisitor Australian visa application. Applicant must be the citizen of one of the ETA eligible countries for Australia or be the citizen of European Union where applicable. Applicant must be tuberculosis free. Applicant must disclose if he/she has any criminal convictions for which he/she has been sentenced for a total collective period of twelve months or more, whether it is already served yet or not. Legally, ETA/eVisitor Australian visa holders are not permitted to do any paid work of any kind in Australia during their travel period. However, they may undertake business visitor activities such as business enquiries and attending conferences etc. Therefore, should one work whilst on an ETA/eVisitor visa, they will risk being detained and removed from Australia. Further to this, they are likely to be liable for all costs related to detention and removal from Australia. An ETA/eVisitor visa grants 12 months validity. Therefore, visa holders can enter and leave Australia as many times as they wish, until their visa has expired. 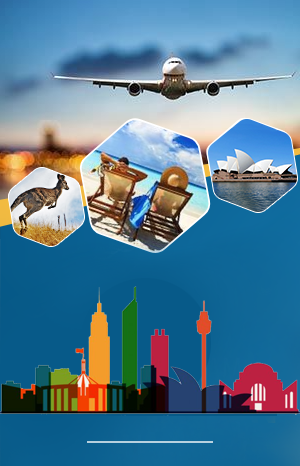 However, visa holders can only stay in Australia for a maximum period of three months on each visit and must leave the Australian territory within this period. It is permissible that one may re-visit Australia even after only a few days and stays a further 3 months. When arriving in Australia, the visa holders must carry the valid travel document. Without the valid travel document, entering to Australia can be rejected or delayed until their identity and claims have been confirmed. An Australian ETA or eVisitor visa is relatively simple and easy to apply online, should one be the citizen of an ETA eligible country or be the citizen of one of the European Union countries. Full list of Australian ETA eligible countries and the eligible countries of European Union are here. MEET WEEKEND TOURS & TRAVEL PTY. LTD. Copyright © 2018 ETA Support Australia. All Rights Reserved.